OLD PRESS CLUB BAR. Reliable Source (members only) is the name of the bar inside the National Press Club in DC but in 1933 it was called the Tap Room (now the library). 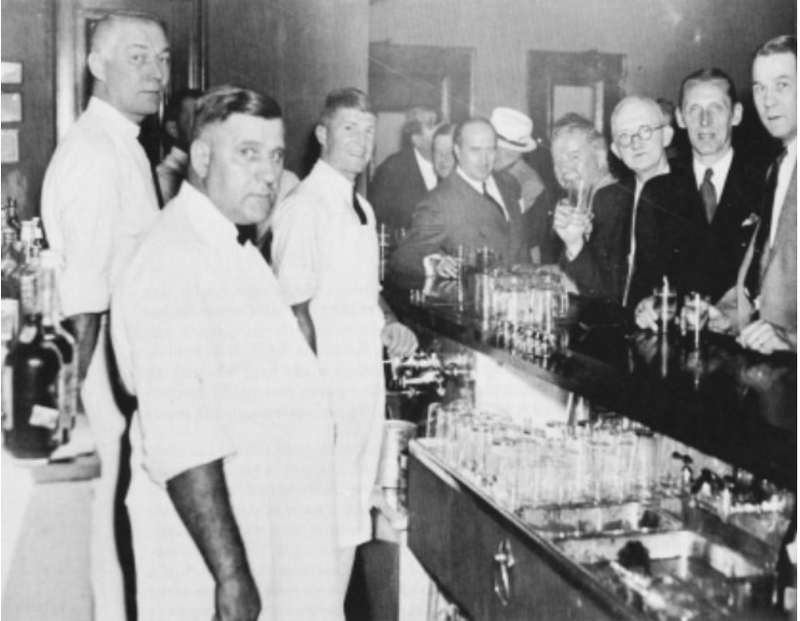 National Press Club photo shows opening day of the bar immediately following the end of Prohibition. Touting its clout, the NPC’s bar received liquor license #1. Just saying. 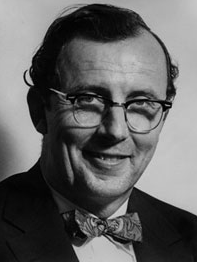 Reporter and National Press Club President Frank Holeman, 1956. GUEST BOOK REVIEWER / By Gilbert Klein, Historian, National Press Club, Washington DC.--It’s a tale of intrigue that took place in plain sight at the National Press Club bar, even as it remained hidden from common knowledge for decades as the participants kept their mouths shut – or didn’t even know what they had done. It’s the role the Club played in the Cuban Missile Crisis. I was not aware of any of it until 1998 when an AP story cited recently opened Soviet archives that hinted at the role a Club bartender played with KGB agents masquerading as correspondents for TASS, the Soviet News Agency. 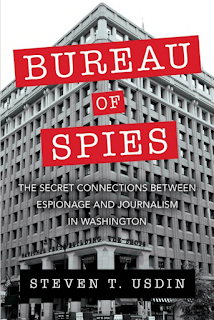 And I was not aware of the full story until the publication in 2018 of Steven Usdin’s, “Bureau of Spies: The Secret Connections between Espionage and Journalism in Washington.” [see end of article]. A lot of it involved the role of Frank Holeman, the New York Daily News reporter and 1956 Club president who became such a beloved former club president that the Main Lounge was renamed for him. I had spent a lot of time with Frank during lunch at the Club before his death in 1996, but he never told me how he had served as a conduit between the Kennedy administration and the Kremlin at one of the most frightening periods in history. The story is complex, and Usdin spends thousands of words telling it. I will try to sum it up here. TASS maintained its office in the building, in fact on the 13th floor back in the days when the corridor that now leads to the Fourth Estate dining room was occupied by news bureaus. That was just a few steps from the Tap Room, the Club’s bar that was located where the library now sits. In the 1950s and ‘60s, the Tap Room was often three-deep at the bar from lunchtime well into the night. Holeman (pictured, left) struck up a friendship with TASS bureau chief Georgi Nikitovich Bolshakov, who not only was a Soviet spy but also a close friend of Soviet Premier Nikita Khrushchev’s son-in-law, giving him connections right into the Kremlin. Bolshakov introduced Holeman to Yuri Gvozdev, a Soviet agent who posed as a cultural attache. At the same time, Holeman was a friend of Vice President Richard Nixon. Holeman set up a back channel between Nixon and the Soviets, conveying informal messages back and forth to the Soviet leadership. This was a way for them to communicate without going through formal channels. By the end of the Eisenhower administration, Holeman had conveyed messages that helped defuse some of the most dangerous confrontations of the Cold War. Holeman’s role did not end when the Kennedy administration swept into office in 1961. He let Attorney General Robert Kennedy know of the role he had played with Nixon, and as early as May, 1961, he had set up a meeting between Bobby Kennedy and a Georgi Bolshakov, a Soviet agent, who later introduced him to the president. Holeman’s contacts became crucial in the explosive weeks surrounding the Cuban Missile Crisis after American intelligence discovered the Soviets were setting up nuclear missiles that threatened much of the United States. The possibility of a nuclear confrontation was real. With the New York Daily News on strike during this critical time, Holeman was actually temporarily working for the attorney general. Holeman called the Soviet embassy and told Bolshakov that Kennedy had instructed him to say the United States could be persuaded to remove its missiles in Turkey and Italy if the Soviets removed theirs from Cuba. At the same time, back at the Club’s Tap Room, New York Herald Tribune reporter Warren Rogers – who would go on to be Club president in 1970 – was talking to his bureau chief about contingency plans for covering a U.S. invasion of Cuba. Rogers would be one of eight reporters accompanying the troops. They did not notice the popular bartender, Johnny Prokoff, listening in. Prokoff was a Russian from Lithuania, then a part of the Soviet Union, who managed to escape in 1938 by stowing away on a freighter. Just after Prokoff overheard the conversation, TASS reporter and Soviet agent Anatoly Gorsky walked into the Tap Room. While Prokoff hated communism, he and Gorsky were mutual avid chess players and friends. There’s no evidence that Prokoff was a Soviet agent. What Prokoff told Gorsky got mixed up a bit. What Gorsky thought he heard was that the invasion was on and these reporters were heading to cover it. That was different from what was actually said: IF there was an invasion, these reporters were going. Gorsky rushed to the Soviet embassy to get the word back to the Kremlin that an invasion was imminent. A KGB agent found Rogers in a parking lot behind the Willard Hotel. The agent asked Rogers whether Kennedy means what he says. To which Rogers replied, “You’re damn right he does.” The Soviet embassy concluded that meant the invasion would begin in two days. An embassy official arranged with Rogers to have lunch that day. Rogers hoped he would get a story out of it. Instead, Rogers did most of the talking about a possible U.S. invasion, even though he had no inside information at all. Those conversations landed on Khrushchev’s desk the next day, and they played into the Soviet leader’s decision to respect the American blockade and to announce his decision to remove offensive weapons from Cuba. ABOUT THE BOOK: Covert intelligence gathering, propaganda, fake news stories, dirty tricks--these tools of spy craft have been used for seven decades by agents hiding in plain sight in Washington's National Press Building. 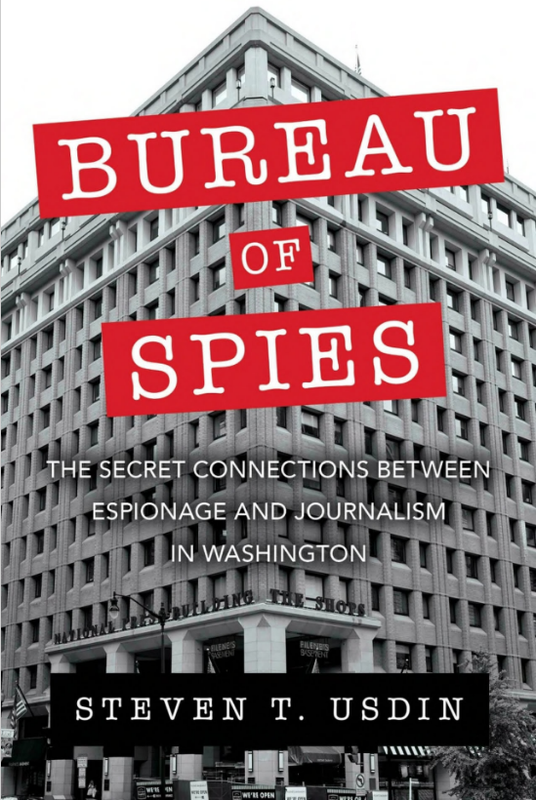 This revealing book tells the story of espionage conducted by both US and foreign intelligence operatives just blocks from the White House. 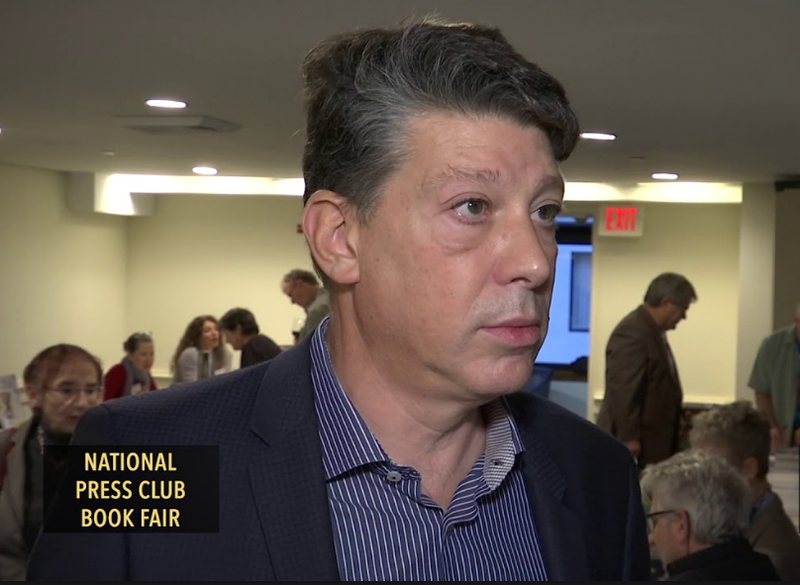 Journalist Steven T. Usdin details how spies for Nazi Germany, imperial Japan, the Soviet Union, and the CIA have operated from the offices, corridors, and bars of this well-known press center to collect military, political, and commercial secrets. As the author's extensive research shows, efforts to influence American elections by foreign governments are nothing new, and WikiLeaks is not the first antisecrecy group to dump huge quantities of classified data into the public domain. Among other cases, the book documents the work of a journalist who created a secret intelligence organization that reported directly to President Franklin Roosevelt and two generations of Soviet spies who operated undercover as TASS reporters and ran circles around the FBI. The author also reveals the important roles played by journalists in the Cuban missile crisis, and presents information about a spy involved in the Watergate break-in who had earlier spied on Republican presidential candidate Barry Goldwater for then-President Lyndon Johnson. Based on interviews with retired CIA, NSA, FBI, and KGB officers, as well as declassified and leaked intelligence documents, this fascinating historical narrative shows how the worlds of journalism and intelligence sometimes overlap and highlights the ethical quandaries that espionage invariably creates. 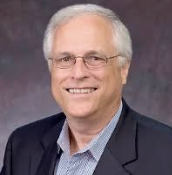 ABOUT THE AUTHOR: Steven T. Usdin is the author of Engineering Communism: How Two Americans Spied for Stalin and Founded the Soviet Silicon Valley. He has written extensively about Cold War espionage, and has been invited to present papers to and participate on panels about espionage issues organized by the National Security Agency, Woodrow Wilson Center for Scholars, the National Archives, International Spy Museum, and other organizations. Usdin is the Washington editor of BioCentury. His reporting focuses on the intersection of public policy and biomedicine. He has lived and worked in Japan, Italy, Britain, and Hong Kong, and has traveled extensively in Russia and the former Soviet Union, Turkey, and Central and South America.